We may have been ahead of our time. When we published Visual Marketing, tools like Pinterest and Instagram were fledgling marketing components. Now they’re growing in use, and more people are using the phrase, “visual marketing.” Go us! We absolutely agree with Douglas, and thank him for quoting Visual Marketing! 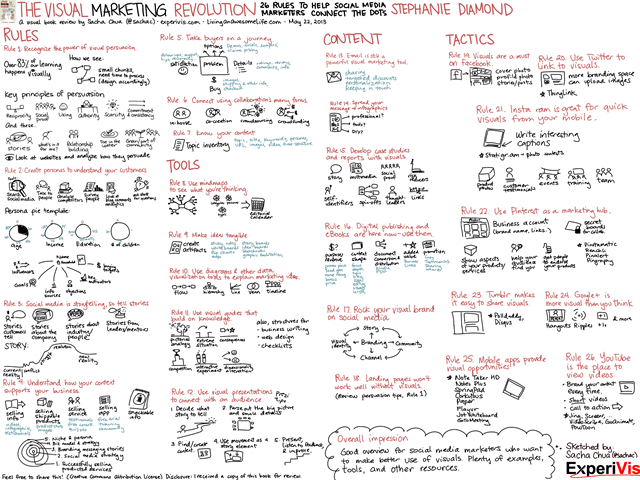 And speaking of creative use of visual marketing, we loved this visual book review of The Visual Marketing Revolution: 26 Rules to Help Social Media Marketers Connect the Dots by Stephanie Diamond, created by Sacha Chua. What an innovative way to review a book!